My body never liked alcohol but it was part of our social life. Many friends thought I was weird when I gave up drinking alcohol but my body said a big thank you and now it is so normal nobody thinks I’m weird any more. Remembering how I used to feel when I drank, I now deeply treasure the fact that my life is alcohol free and appreciate myself for making this choice. I too hate alcohol and the impact that it has had on my life and those of so many others. Seeing someone you love change into a monster when they are drunk is scary and knowing that getting their next drink is more important to them than anything else brought home to me just how much damage this poisonous substance can inflict on so many households around the world which is reflected in the statistics that you quote. I have never really drunk alcohol and have always disliked intensely the stench of it, both figuratively and literally. As a teenager when my friends started getting drunk I’d call it a night and go home. As a teenager also I used to work behind a function bar at Christmas and simply couldn’t relate to the clients who got so drunk they could barely talk, spiked each other’s drinks or who got really obnoxious and loud. As an older adult I avoided town centres on Friday and Saturday nights at pub closing like the plague, given how unsafe I felt at this time. To me alcohol has always been a poison to the body and to society and until we find the self love that can see the truth of this then this abuse will continue. The energy that comes through people when they drink alcohol is pretty vile, yes it reigns havoc amongst families and communities. I don’t think I ever really liked alcohol I learnt to like it to fit in with my friends because they seemed to enjoy themselves more, but looking back their enjoyment was based on recklessness and doing things they wouldn’t do if sober. I wonder how many people actually enjoy it as they say they do or are they enjoying the moments of not having to feel responsible for anything. Good question Alison and I would hazard a guess that it’s not so much the alcohol per say that people enjoy but the ‘reprieve’ that it appears to provide in the tension that people feel as a result of the choices that they are making. Make different choices and the tension disappears and when the tension disappears, so does the desire to drink alcohol. There is much to be said and done to denormalise the acceptance of alcohol in our everyday lives. We have become so desensitised to the negative impacts of alcohol, that we do not address the issue right in front of our eyes. My father only drank alcohol once. He tasted it, went ‘Yuk’ and never touched it again. He had the strength to ignore the peer pressure to enjoin in the ‘drink fest’ and went his own way. He’s not with us anymore, but it’s great to appreciate this about him. ‘The morning after’ is very telling – not just physically but mentally and emotionally too. There is often a very clear sense of ‘I’ll never drink again’ but also deep regret at what has happened and what took place whilst ‘under the influence’. Often we make a joke of it – but this is just covering up the shame in my view. Our expression changes with alcohol and often our actions too. We do things we would never do when sober, taking risks, selling ourselves out. It isn’t really funny in my view. But we make a joke of it to make light of our irresponsibility. The UK is littered with closed down and derelict looking pubs. I wonder if this is something to rejoice or are we simply doing our drinking at home in front of the telly? This is very interesting Doug. Also, I wonder if people have busier lives and not meeting up with friends to go for a drink. The no drink driving policy may also be a contributing factor too. My relationship with alcohol ended abruptly. When I recognized the poison that it was, It left me and I didn’t chase it back. I didn’t even consider that I had given up drinking alcohol. I agree with everything you present here, but I can also easily imagine how me 15 years ago as a heavy drinker would react to this article – agreeing with everything you say up to a point, but going ‘But I am handling it well’ and even getting angry about your hate for the substance because of your love for humanity – arguing that love was something that would let me do whatever I liked, so leave me alone, it’s none of your business. Even when our body is telling us loud and clear, without a clear reference point of another way, it is really hard to wake up from a slumber of our chosen normal, and bring a dose of honesty to see things for what they are, and start making choices from that place, instead of the normal we have long been subscribing to. A study involving nearly 10,000 young people in the UK found that the proportion of 16 to 24-year-olds who say they never drink alcohol rose from 18% in 2005 to 29% in 2015. (1). Over time and with increasing awareness more young people will associate alcohol with its harmful effects and steer away from it, rather than be enticed by peers and grossly misleading and irresponsible marketing. You have said here that many people feel they cannot celebrate a big milestone without drinking alcohol, and I agree and would say that in addition to this, many people who I know also feel that they cannot end the day with out drinking alcohol. And while we must be careful not to judge, because everyone has the free will to do as they please, it is at least worth raising the conversation, as you have done, about what the real affects of alcohol are. When I was ready to give up alcohol, I became aware of the obscene way it permeated all aspects of life. It’s everywhere, social and celebratory occasions, in the home, supermarkets and stores, greetings cards now overtly sell alcohol and increasingly toiletries for women and children are named after wines and spirits. Another disturbing trend, ‘child friendly’ pubs where parents routinely take children (and babies) to pubs evenings and weekends. It is not that long ago a home treatment for children that were teething was to dab some alcohol on their gums knowing it would numb the area. And, we still consumed it knowing what it does to our bodies! What about the assumption that it was something that would naturally be in every home? When we see and truly allow ourselves to open our eyes to the real devastation of alcohol abuse we can perhaps understand why it is not only a chemical poison but one of the greatest factors in domestic violence the world over. I grew up in an alcohol free home, as my family were practising Methodists. But as a teenager, this foundation did not hold, and I joined others, drank alcohol and got drunk as a norm. These and my student years were the worst phases for me and can understand how young people get sucked into drinking this dreadful poison. In my thirties, forties and fifties, alcohol was less important and easy for me to stop completely, once I understood how harmful it was. I too hate alcohol. It is a total waste of money, like pouring it down the drain, but that would be preferable to pouring alcohol inside the body, it is a poison. I hate how it is so acceptable in society, to the point that anyone who does not drink is viewed as a pariah. It has a huge contribution to crime related events. It changes who we are, and it ruins relationships and people’s lives. “Let’s be absolutely honest: we all know deep down that alcohol is harming us and harming our societies.” Yes I agree and therefore I love what you have shared in your awesome blog. It is a fact that alcohol is a poison and fortunately it it our own choice to love our body so much to not poison it. There are many things in the world that we would be much better off without, all abuse of any kind. There is a reason why we go for any substances that alters our body. I feel it’s important for us to be exposed to the truth of the harm caused but also look at why we choose it or else one poison is replaced by another. Thank you anonymous for sharing the devastating statistics of this poison. I have to agree with you here on the horrible effect alcohol has on society and people everywhere. With the comment on Yeshua, there is a story of him turning water into wine and other parts of the bible that wine is mentioned. I don’t think that translates into how we could / should live today, but it might explain while people who follow the teachings might drink it. Why we have created a substance that potentially causes such harm is worth considering… and it is not only alcohol but other drugs foods also. It is not only a matter of simply removing these from our lives but truly having a deeper look at why and what true purpose they are serving? ‘Is it not time that we de-normalised the drinking of alcohol?’ I’d say yes and we are way overdue for this. Everything is pointing to the fact that alcohol is a poison, it causes so much damage to lives but the truth is, if we take away alcohol, I reckon our ill behaviours and choices will simply be shifted to something else. Perhaps we need to look at why we as a society need alcohol and consume it to such an extent when we know it is harmful, so what is really going on? 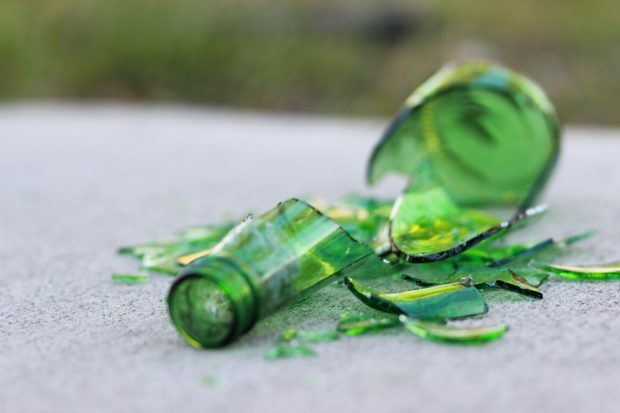 Such a great article anonymous and when you put all the reasons why alcohol damages our society into the one article, it really does highlight how hideous a substance it is and how crazy it is that we glamorise and hold it up as being a wonderful part of life. As you say, we use it to celebrate and mark pretty much every occasion, without acknowledging that it is undermining us and life even amidst the celebrating. Alcohol is a brute force in diminishing the potential of us as individuals and us as a society, it’s an uncouth bully even when it’s dressed up as champagne. Our alcohol consumption is a direct reflection of our pain. A sobering pondering for humanity. This is a great sharing on how we poison ourselves with beer, spirits and wine. The most pertinent question though to ask is ‘why?’. Why do we choose to harm ourselves in the first place? To explore this is to truly let the genie out of the bottle on the human malaise. That we are willing to introduce into the body, a substance that is a known poison, is an indication of how far we have strayed from our essence, which is love. If we truly want to alleviate our suffering that has us reaching for alcohol in the first place, we must first come back to this love and allow the embodiment of it to inform our movements. Only then will we not seek to abuse the vessel (our body) that such love is enhoused within. Such abuse is not inflicted by alcohol alone but by the many and various substances (energetic vibrations) we consume such as foods, beliefs, emotions etc. that are unsupportive for our body and as such inhibit our expression of a love that lives within but is not being allowed out. This is easier said than done in the sense that this journey back into our hearts and all the wisdom, love and joy that resides within them can take many, many lives. However, that said it is a simple movement that is made in a single moment to realign with our true source of energy and not the one that leads us away from it. From here it is up to us how steady we hold with this alignment. It is a work in progress for us all. Anytime we get a hangover, we are being ‘messaged’ by our body that drinking alcohol isn’t a good idea. Interestingly, when I stopped drinking I still got hangovers and found that they are related to food choices too, and the quality of sleep. The body continuously sends us it’s messages if we are willing to hear them. Yes our bodies will always communicate with us over our less wise choices – the question is are we listening? Giving up alcohol is a good start but unless we are ready to honour our bodies we run the risk of finding an alternative way to abuse them. I have had the same. The body can speak loudly! It has been over 12 years since I last had an alcoholic drink and I too love my life without it. The fact is, I have reconnected to a sense of who I am and it feels amazing – and alcohol would only diminish that feeling so there is no need to nor point in having it any more. Our world is better without alcohol. Yet we know that alcohol temporally reliefs us from feeling pain,uncomfortable, but at the end sums up in harm in our body and psyche (wellbeing). Hence, it would be far wiser to look at the truth of why we consume alcohol and why we seem to protect it, even though we know the effects of how it harms our body and wellbeing? Now, that would be a wise and loving choice. Wonderful expression about the truth of what alcohol is and what affect it has on our world! Typically the use of alcohol can negate the discernment for when enough is enough as a downward slope. Since I gave up I can really feel more clearly what it did to me and I deeply appreciate being free of all that. One thimbleful of poison is still poison – that’s how I see it. Yes great point, imagine what society would be like without alcohol? Just that one thing would clean up our world no end just by having people being themselves rather than checked out from responsibility by using it. I too love my alcohol free life, as a progression from never really drinking all that much myself. I feel much more healthy and clear headed, and really appreciate spending time with others when we can have the “meaningful conversations and loving connections” mentioned here. Our body only needs true nutrition and alcohol is not part of that so what part of us is craving alcohol is a good question to ask and will help us understand why we drink a substance that is registered as a poison. Hm ‘destroy’ is a great word. Alcohol wreaks havoc, in our bodies, in our families and in our communities. When we make it about love of people, many ingrained ideals and beliefs are seen for the harm they generate and their hold on us starts to weaken. I agree with what alcohol contributes to in our society but to me there is more here, for if alcohol did not exist I would bet my bottom dollar that there would be another substance, another emotion, another behaviour that would take its place. The more we blame the substance the less responsibility is put on ourselves for making the choice to drink, or whatever else the case may be. Alcohol may be involved in those statistics but at the end of the day it is a human being making that choice, and in the full knowing of the consequences too. Super wise and an invitation to us all. No-one who drinks alcohol, literally no-one doesn’t know that it isn’t bad for them. Thus this self-destructive, self-abusive, self-denying escape is absolutely a conscious choice and so the power (responsibility) is entirely in our hands. Well said Michael. Yes, well said Michael. The choice to drink alcohol is a symptom of something deeper. That is what we need to be addressing.